Hot dogs, synonymous for many with ‘summertime’ food, will never be mistaken for a health food. But how bad are they? Can you do minimal diet damage and still enjoy an occasional hot dog as a treat? Why are they so unhealthy to begin with? 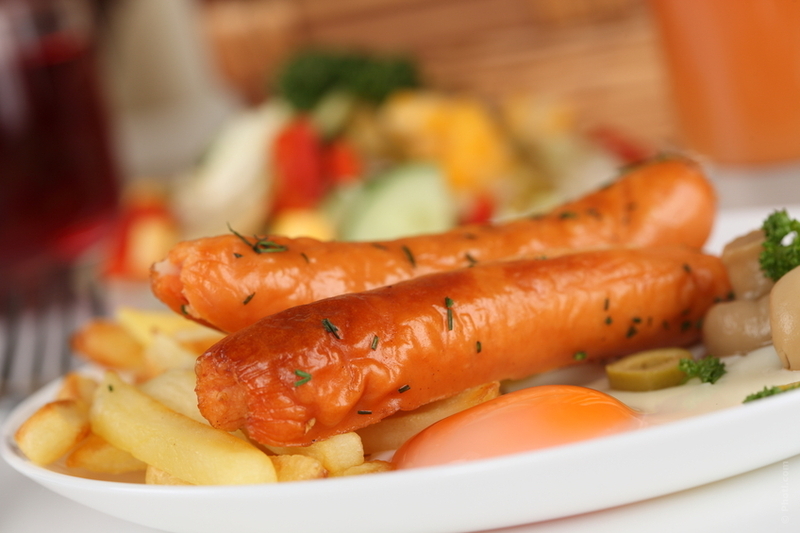 First, the bad news: hot dogs are processed meat products, full of calories, sodium, cholesterol and fat. This processed ‘cured’ meat product contains sodium nitrite, a preservative that gives hot dogs a pinkish-red color and helps to prevent botulism food poisoning. Cooked over hot coals, nitrite can react with naturally occurring compounds in processed meat to form nitrosamines/ nitrosamides, connected with the development of certain types of cancers. Add to that the fact that consuming a diet rich in red meat alone is connected with an increased risk of developing colon cancer…for overall health, it is best to limit red meat consumption but be particularly cautious with processed meats (deli meats, bacon, sausage, hot dogs…). Choose small or regular-sized pork or beef hot dogs over ‘jumbo’ hot dogs. A smaller-sized hot dog (around 40 to 50 grams) typically offers less than 150 calories per wiener but a jumbo dog (close to twice the size) can provide, predictably, twice the amount of calories, and that’s before the hot dog bun and condiments. Look for brands of hot dogs that are low in saturated fat (providing no more than 3 grams per wiener, 2 grams is even better) and not too high in sodium (about 400 to 450 mg per wiener). Try a veggie or turkey dog instead. You may not save much on sodium, but you will on calories and fat, and consume no saturated fat by choosing these dogs. A veggie dog offers, on average, 60 to 70 calories, less than 2g fat and less than 400 mg sodium. Veggie hot dogs are also sodium nitrite-free. Finally, choose a whole grain hot dog bun and be careful with high-calorie toppings. Try a squeeze of yellow mustard, onions and tomatoes. Keep in mind that most condiments are sodium-rich. Balance your plate with healthy choices, such as fresh watermelon and a three-bean salad.